The Center and Guards are responsible for the depth of the pocket which means they will aggressive pass set trying to keep their defenders as close and near to the line of scrimmage as possible. 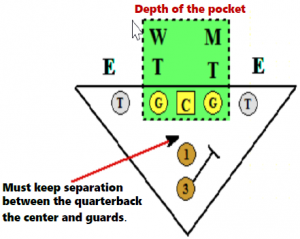 With pocket protection make sure your linemen are working from an inside out position on their defender. Your center and guards should always work to keep as much separation between themselves and the quarterback. This is called never compromising the depth of the pocket. Your guards want to work as near and close to the line of scrimmage as possible. If one of your guards is uncovered he should help his center with a hand check while working his double read. Tackles while using their half-man-advantage will always work from an inside out position trying to widen the pocket. Must be able to teach them how to kick slide since they will be trying to widen their defenders. Must push the outside rush past the quarterback. Tackles read the “V” of the neck of their defender to determine the angle of kick. Whenever your offensive tackle kick-slides, he wants to keep his shoulder lean inside, this is what we call shoulder in the hole. By keeping the inside shoulder in the hole, will keep the tackles defender from making the inside move that potentially could compromise the pocket. Tackles are working to push the outside rush past the quarterback. Offensive Tackles will read the “V” of the neck of their defender in order to determine their proper footwork for any wide rusher. If the “V” of the neck of the defender is pointed up field the tackle will kick to the 1/2 man, from an inside out position. No matter what offensive line position, each offensive lineman will use the 1/2 man advantage to determine his inside out position on his potential rush defender. Whenever covered by an outside shaded defender the general rule for your offensive linemen should be “Set The Anchor To The 1/2 Man”. 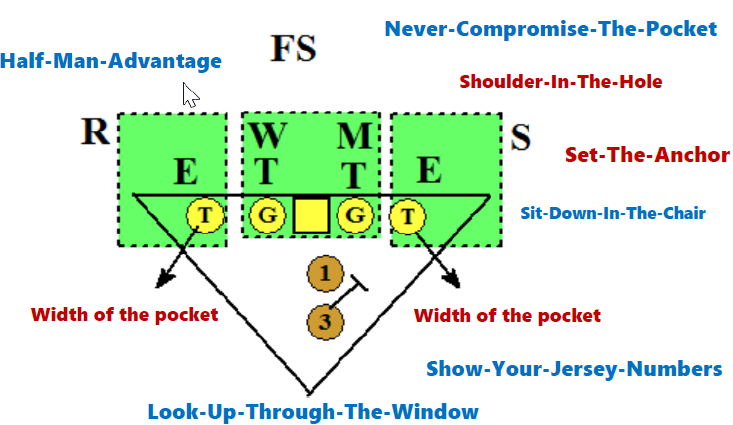 The 1/2 man advantage rule with straight drop back protection is worked from an inside out position. The correct terminology with a defender aligned as a 1/2 defender is to “Pick It Up and Put It Down” By picking up the outside foot and setting the anchor, this will help in bracing vs any potential bull rush. Since the 1/2 man exists then all that is required by your offensive lineman is a pick-up put down. Whenever faced with a head-up defender your offensive line will step inside with their inside foot and then replace with the outside foot (Step Replace). Thus, the procedure for a head up defender is step inside, replace and set the anchor with the outside foot. Whenever stepping inside your lineman should keep a good shoulder lean inside. The inside shoulder should be kept over the inside knee, this is called “Shoulder In The Hole”. Step inside to the 1/2 man, then set your anchor. 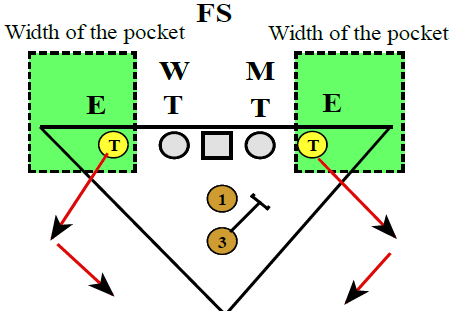 With any defender aligned on the inside shade of an offensive lineman it will require a “Hard” technique while working to their inside 1/2 man position. The Hard technique is a pass set to the inside 1/2 man advantage which puts the offensive lineman working hard across the face of the defender. Because your offensive line is working hard to their inside 1/2 man it usually will put them washing their defender down and to the outside. Step hard to the inside 1/2 man. Excellent illustration of protection concepts and nomenclature.